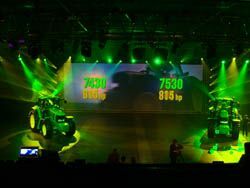 NEW YORK, NY--Unlimited Visibility Lighting Design (UVLD) recently marked its ninth collaboration with Curt Reed, executive producer of St. Louis-based See Our Solutions on a major corporate event for John Deere. Curt hired UVLD, and led the creative process, on a 24-day series of meetings at Poland's Warsaw Expo Center for the Agricultural Division's European dealers. Approximately 5,000 dealers attended the meetings, which unrolled in six geographical waves and encompassed 15 languages. UVLD lit reveals of new products for the opening night celebration, provided speaker support for the sales meetings that followed, and was entrusted with designing the reveal for a concept vehicle on the closing night.UVLD deployed an array of Vari*Lite automated fixtures for aerial effects with the atmospheric haze, to define texture and space, and to light John Deere's tractors. The moving lights consisted of 30 VL3000 spots, 28 VL3000 washes, 36 VL2500 spots, and 13 VL2500 washes. Twenty-four Martin Atomic 3000 strobes furnished additional effects during the reveal portions of the opening-night show; four DF50 haze machines generated the atmospheric haze. Sixty-six Source 4 ERS and 74 Source 4 PARs provided mostly white light for speaker support; they were also tapped to front light the tractors driving across the stage. Ten confetti cannons gave a festive finish to the meetings' finale. UVLD controlled the lighting instruments with two active, and one back up, Hog iPC consoles running Hog2PC software. A pair of Hog iPC expansion wings were also utilized. For more information visit www.uvld.com.